We are pleased to partner with Allegiance Publishing to offer a series of compelling, original articles that will be customized for a limited number of advisors with their branding. These longer-form articles will deliver lasting value to your clients, prospects, associates, collaborative team members, and others with whom you work and interact. The first two articles in the series are described below, and you can download them for review. Along with each article, we provide you with a short pre-written message that is specific to that article for you to use when you email or mail the article. Details about the series, investment options, built-in marketing support and delivery formats are also included on this page. This turnkey marketing program provides you with 8 original articles that can be delivered over a 1 year period. Each is designed to help build a stronger relationship between you and your clients and prospects. Each article is branded with your information, and each addresses a value that studies have shown are extremely important to most 'A' clients. You can choose to have a single piece customized, or you can subscribe to the entire series at a discounted price. (And receive several valuable premiums at no extra cost.) Either way, as a single article or the complete series of 8, you will also get pre-written content that introduces each individual article's content. Simply paste the content into an email, attach the PDF, and press send. Or, paste the content into a letter and insert a printed copy of the article. Either way, you can quickly and effortlessly communicate messages that will resonate with your clients and prospects for a long time. The Articles are Memorable & Compelling. Best of all, they come from you. Below are the first 2 articles in the series of 8. You can invest in them one-by-one, get 2 at a time for a discounted price, or you can subscribe to the entire series at a greatly reduced investment per article. We'll place your logo and contact information on the cover and back page, and provide you with content to use when you share the articles with your clients, prospects and associates. This series provides your business with easy, effective, and productive turnkey marketing that will differentiate you from other professionals. There may be no bond more important to build, maintain and grow with everyone in your life than the bond of trust. Trust defines our relationships, and it is one of the greatest gifts we can give or receive. 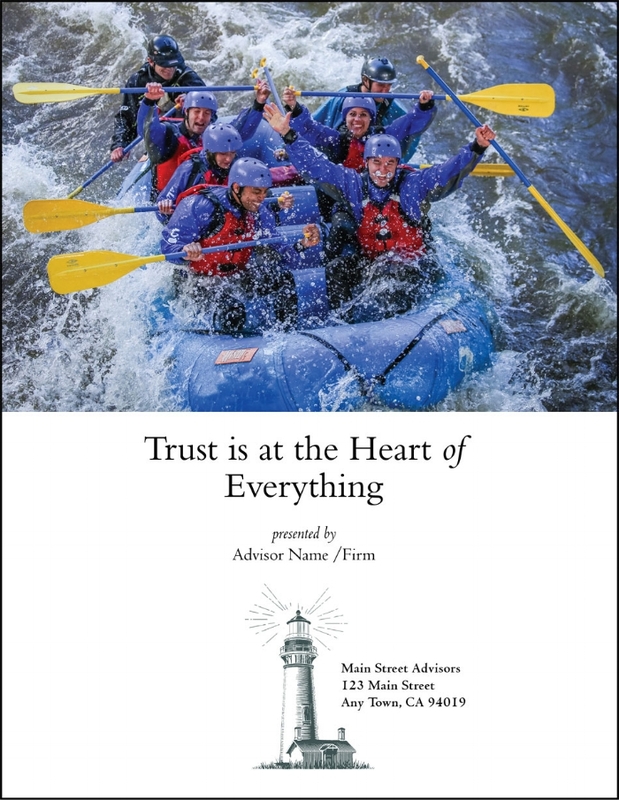 This article explores trust, and its role in every aspect of our lives. When you share this article with your branding on the cover page, title page, and closing page, you will provide those with whom you share the article an experience they will thank you for, and remember for years to come. Read the article HERE. Learn how you can put this article to work for your business below. LIMITED TO 100 PROFESSIONALS The value of your customized article will be enhanced by the fact that we are restricting the customization process to no more than 100 advisors per individual article. Given that there are more than 400,000 advisors in the United States, this restriction provides you with a significant and tangible marketing differentiator. Each of us is regarded by other people now, just as we will be remembered in the future, for the courtesies and kindnesses we extend to others. Courtesy has been called the 'forgotten' virtue. 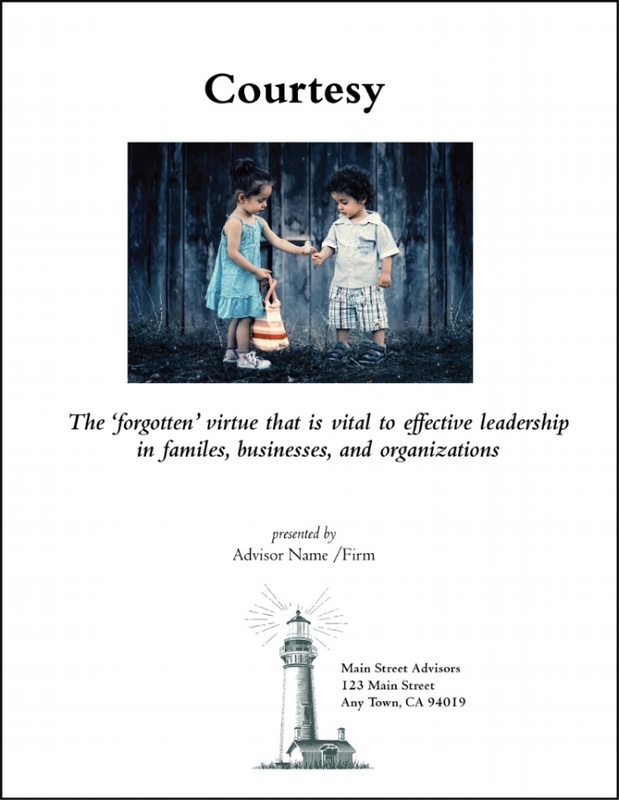 This article explores the values and benefits of courteous action, and shows how they apply to every aspect of our personal, professional and community lives. When you share this article with people (featuring your branding), you are telling them how important the courtesies of life (big & small) are to you. YOUR INVESTMENT The cost to customize an article is $495.00. Customize two articles at the same time for $397.50 per article (total $795.00), a $195.00 savings over the cost of doing two articles at different times. Or, subscribe to the complete series of 8 articles (1 delivered about every 6-7 weeks) at a cost of $350.00 per article, and save $1,160.00 over the single article cost. The special subscription discount requires full payment ($2,800.00) in advance. See the titles of each article in the series below, and, also see below to learn about the free, premium gifts valued at over $350.00 that only subscribers to the series will receive. WHAT YOU PROVIDE When you place your order and make payment, we will ask you to provide a high-resolution image of your business logo, plus the name you wish on the article (individual offices can have two names on the article), and your contact information. It's that simple. 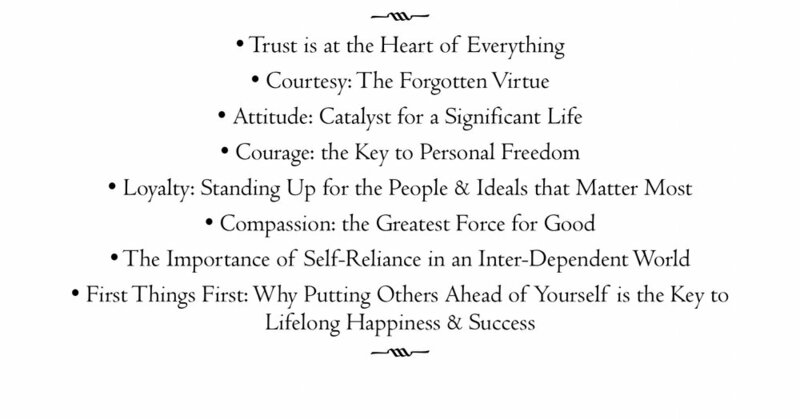 This series is comprised of 8 original articles that deal with some of the values and virtues that contribute to success as an individual, a family, or a business or organizational leader, and that have been identified as being very important to 'A' clients. Please review the sample articles above for average length, layout and design style. Titles of the articles in this series are listed below. Titles are subject to modification, but the content of new articles will reflect the titles as they are shown here. Series Subscribers Get a Free Case of Books, Plus a Special Holiday Gift! When you subscribe for the 8 article series, you will receive your choice of 1 case (20 books) of our book, Beating the Midas Curse, or 1 case of Rod Zeeb's book, Family Stewardship. The books retail for $339.00 per case. Plus, we pay the shipping. Midas Curse is in its 2nd edition, and is a national best-seller. And, Lloyd Bensten III of the National Christian Foundation says that Zeeb's new book is "...a major contribution to Family Stewardship." These books will make great, thoughtful gifts for your clients or others in your life. Learn more about the books HERE. Choose any one article in the series, and pair it with the holiday of your choice, and we will create a specially branded edition of that article for you. Christmas, Hanukkah, Thanksgiving, Easter, 4th of July (even national Donut Day! ), your special article will feature holiday design motifs, plus a short holiday message from you. You can even choose an article that has already been customized for you. The combination of a holiday-themed article, plus one of the books above, will make a far more memorable gift than than another box of chocolates! Differentiate your business, your services, and yourself with this powerful, productive, easy-to-implement turnkey program.